Made using high-grade brass to prevent rust and breakage. Ball valves allow for easily adjustable flow and pressure. Designed to easily accommodate standard hoses. Never interrupts with water pressure allowing for hassle-free use. Great threading effectively keeps leaks at bay. If you have any questions about this product by Lznlink, contact us by completing and submitting the form below. If you are looking for a specif part number, please include it with your message. 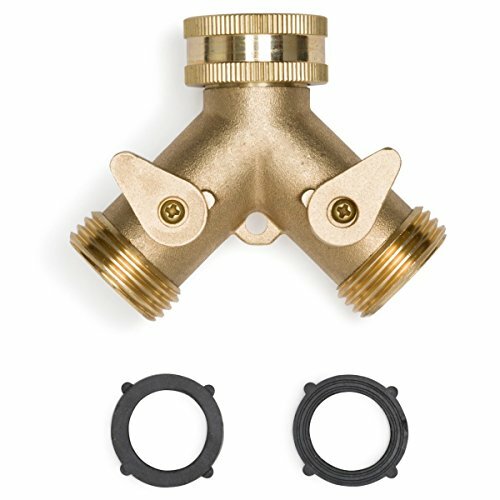 2 Way Garden Y Valve Hose Splitter Easily Converts 1 Spigot into 2 High Flow Water Sources. Made for Home Outdoor Use or Indoors for Washing Machines.